Kids love to make their own crafts. Have them put their artistic energy into a positive activity like making craft gifts their mom is sure to cherish forever. Gifts that can be displayed or have a purpose are great choices because children will enjoy seeing their mom use her gift. Moms work hard and deserve to be pampered, and Mother's Day presents the perfect opportunity to recognize mom's hard work with the gift of pampering. 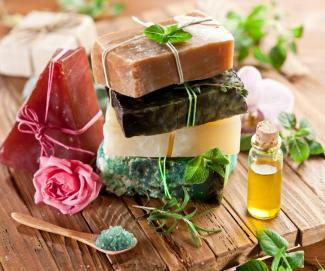 Kids can make homemade soap without the lye, making the process much safer for little kids, and much easier to get good results. Use mom's favorite colors and scents to make a gift that truly relaxes mom. 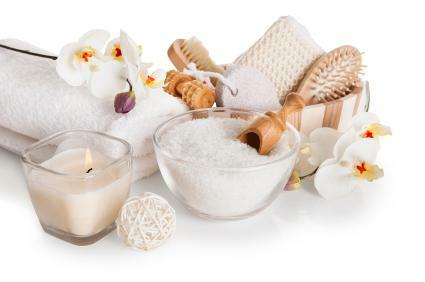 Consider purchasing a small basket and some tulle, and adding homemade bath salts, a candle, and a loofah sponge along with a coupon for a 'Mom's night off' from cooking dinner so she has time to enjoy her pampering gifts. Mother's Day is the perfect time for kids to remember all the fun they have had with Mom. 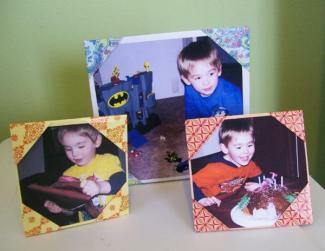 Origami pictures frames are a great way for kids with a tight budget to celebrate those fun times. Have kids choose some favorite pictures that feature Mom. Then, choose origami paper in Mom's favorite colors. Have kids either glue ribbon on the back so that the frames can be hung, or use magnet tape so that the pictures and frames can be displayed on the refrigerator. Either way, these frames are sure to bring a smile to Mom's face every time she sees them. Most moms would much rather receive homemade jewelry made of cereal, painted tube pasta, or colored beads for Mother's Day than anything bought from a jewelry store. 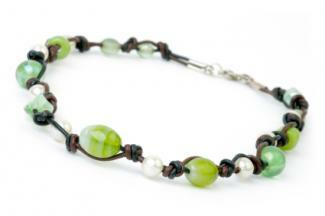 Homemade jewelry makes an inexpensive, easy-to-make Mother's Day gift. Younger children can string cereal or pasta onto strings of yarn while tweens and teenagers can really let their creativity shine and choose a more elaborate beaded necklace. Have kids choose beads in mom's favorite color, and make the gift even more special, choose an outfit, purse, or shoes that match the necklace. All moms marvel at how quickly children grow, so making an impression of her child's handprint is a perfect Mother's Day gift. This is an especially nice gift for new moms. To make this craft, kids -- or an adult if it's for a baby or very young child -- simply dip their hands into non-toxic paint and press them firmly onto paper or a piece of fabric, being sure to keep their fingers spaced apart. They can either "stamp" one set of handprints on the paper or multiple handprints in various colors of paint. If Mom has more than one child, they can each put their handprints on the same paper. 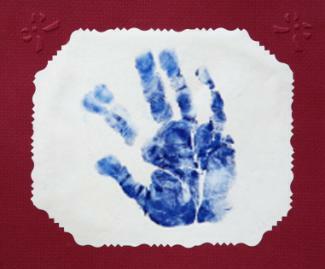 Framing or laminating the handprints preserves the work of art and makes it easy for mom to display. 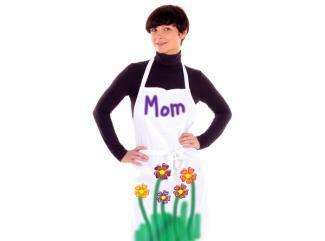 A plain white or colored apron is the perfect blank canvas to create a gift Mom will be pleased to receive and wear. First, the apron should be chosen -- these can usually be found at your local craft supply store and they come in half or full coverage varieties. Then kids can use fabric paint or stencils and stamps to decorate the apron. They may also use fabric markers. If space allows, write a saying such as "World's Greatest Mom," or "Mom of the Year," on the apron. Decoupage is an easy technique for kids, and can result in some beautiful pieces. They can make mom a treasure box by decoupaging a shoebox with their original artwork or they can decoupage a picture frame with pictures of Mom -- almost any item can be decoupaged so the possibilities are only limited to a child's imagination. Moms can use the decoupage box for jewelry, recipes, or other trinkets. For inspiration, most local arts and crafts such as Michaels or Joann Fabric and Craft Stores sell plain, wooden containers in a variety of shapes and sizes that are perfect for decoupaging. 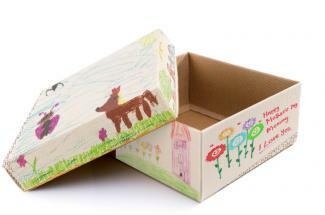 For example, kids might choose a plain wooden recipe box, jewelry box, or bird house. Older kids will likely be able to decoupage without supervision; however, younger kids will need from an adult or older sibling cutting the paper and using the Mod Podge. No matter what item they choose to decoupage, it's sure to be cherished by Mom. For many mothers, the most important thing about Mother's Day is knowing that her kids appreciate and love her. When children choose to make a homemade gift instead of buying one, Mom will be grateful for the time, thought, and effort they put into her special day and will treasure that gift for her lifetime. And, don't forget Grandma on Mother's Day! She would love to receive any of the above gifts from a grandchild to honor the special bond they share.